For nearly 700 hundred years, Aritaurian sages roamed the lands, revered by most, but feared and persecuted by some. The historical records of the ancient beginnings of Aritaurian culture is held through oral tradition, and as such, often becomes a near-fantasmic story of facts entwined with myths and legends. Aritaurians came to be known as shrewd business people, intellectuals, diplomats, philosophers and theologians, respected as judges and as teachers, yet also fiercely patriotic, rallying its warriors to resist foreign invaders or domestic tyrants when their chosen homeland was in peril. Today, The Conclave is a cooperative, prosperous and supportive home for all types of adventurers. We thrive and excel at planning, building and executing initiatives in a manner which is consistent with our Guiding Principles; above all, maintaining a Balance between doing the hard work while ensuring cutting-edge knowledge and research guides our hands. While we work hard, we also play hard, enjoying mild to wild (PG-13!) roleplaying, and a sense of community that is unparalleled in the lands. The Conclave's strength in cooperating together in its endeavours enables it to enjoy wealth, influence and great power. Unparalleled organisation and leadership combined with diverse but excellently executed plans and initiatives across the Duchy are the key to The Conclave's success. While each citizen of The Conclave has the freedom to excel in their chosen field, the nature of The Conclave's opportunities to pool resources and invest them strategically enables everyone to both contribute to and benefit from the multiplicative power of working together wherever possible. This well-organised and transparent system of opportunity generation and management is the defining characteristic of The Conclave. 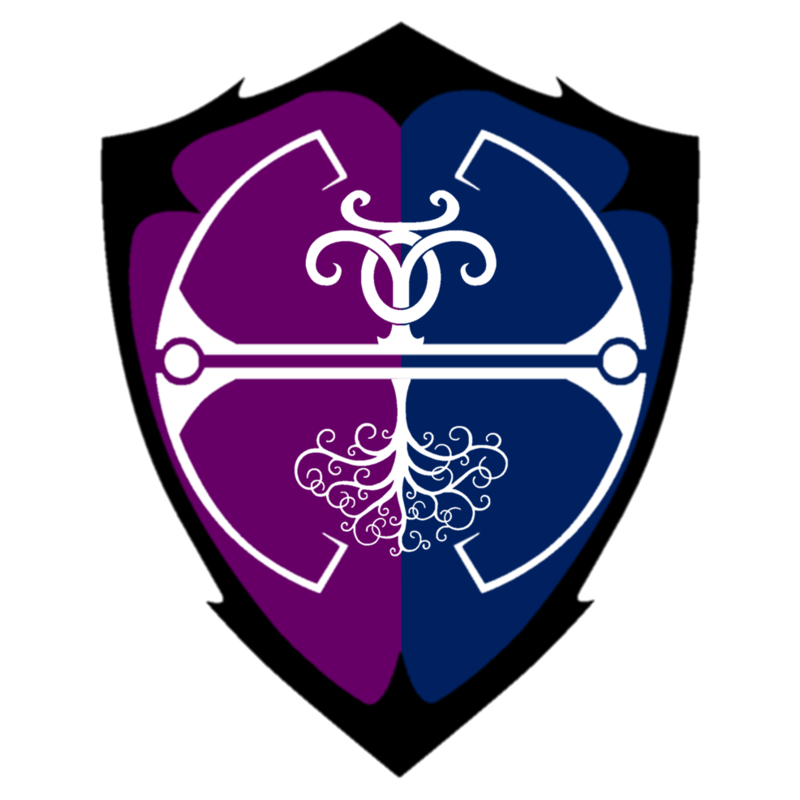 While The Conclave has grown into an advanced, diverse culture, The Guiding Principles have long been adhered to by Aritaurians, and are used when making decisions, large and small, both individually and as a group. The principles are considered well-codified wisdom and guidance, passed on from generation to generation, which do not serve to direct Aritaurians in WHAT to do or think, but rather, tools for HOW to do and think. The Conclave's values are based on these Guiding Principles: Balance, Sanctity of Life, Responsibility, Truth, Openness, Dedication, Prosperity, Respect, Health and Confidence. The Conclave is an economy-centric Duchy, designed to invest in and develop wealth-creating initiatives, which in turn provide for a well-trained and well-equipped military. The Conclave's economic prowess is the bedrock of its success. The Conclave's three-point Economic Prosperity Plan is designed to ensure that Supply, Trade and Investment are the focus of Duchy resources, which gives every Aritaurian access to greater returns on investment, no matter their expertise. This system is driven by a mission to use capitalistic maneuvers to serve socialist ideals; we will create and distribute wealth transparently and the more one contributes, the more one receives when returns on investment are gained. The Conclave has always housed strong warrior tribes, even if they have gone largely unnoticed throughout the ages. Acting independently of each other for generations brought great diversity and strength to the tribes as a whole when they periodically came together to train and share knowledge. Even still, they met their match when the invaders stormed over Vornair as a whole. The military of The Conclave is known as The Aritaurian Guard. The Kingdom of Vornair’s overall theme is to give you the tools to let you play the game the way you want to play. 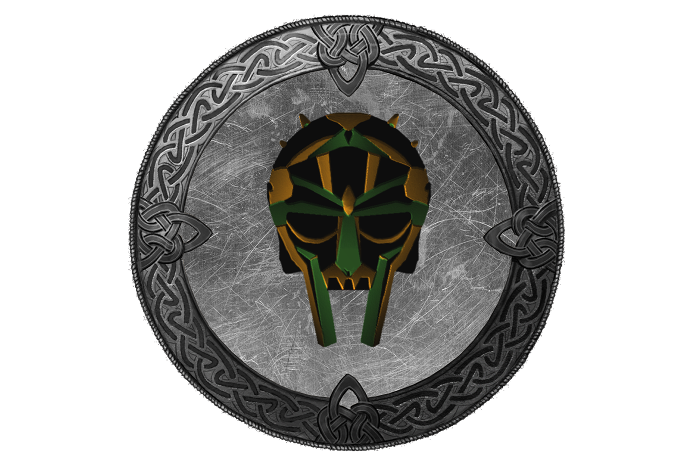 We stand by that vision in The Conclave of Aritaur and in The Aritaurian Guard, our military. Our infrastructure is designed to attract combat-oriented players, let them play with their friends and gaming groups with little interference, and to connect them to the Duchy as a whole for coordination and large-scale command, social ties, resources, and awesome gameplay content. Our strong economy ensures all our PvP-adventurers who choose to participate in the Duchy's military are well compensated and well trained. The Conclave is home to those who want to remake the world with reference to the past, and engage in the pursuit of advanced knowledge in their chosen discipline while living in balance with the Earth and the Cosmos. This broad statement is symbolic of The Conclave's culture as a whole. All aspects of Aritaurians' culture are held dear by its inhabitants, and each person's unique contribution is valued. There is no single culture genre that represents The Conclave, but rather, it is a living, thriving and ever-changing entity comprised of the values, traditions, aspirations, ambitions and beliefs of its inhabitants. Everyone is welcome, all types of lifestyles are embraced, and so long as we remain adherent to the Guiding Principles, our culture is defined by the contribution we all make to our community everyday, both actively and simply by being a part thereof. The Conclave values Balance, holding both Aspects of the Earth and Aspects of the Cosmos in equilibrium. 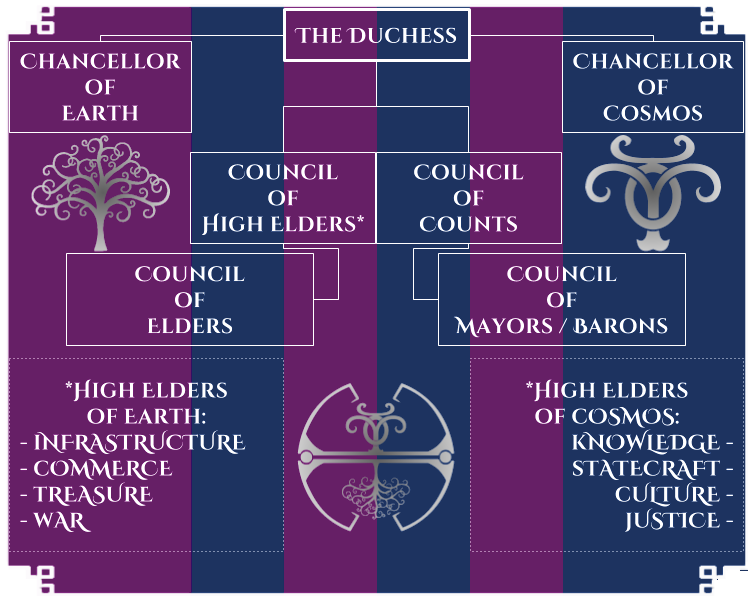 As such, the government is divided to into two departments, with each division led by a High Elder that works directly with the Duchess. In accordance with The Guiding Principles, the various roles support and serve the citizenry of The Conclave through providing guidance, leadership and expertise in eight distinct areas. This structure is illustrated below. This group of leaders is known as The Council of High Elders. The High Elders have specific duties, combined with the authority and responsibility to see them through, allowing them fully manage their areas of responsibility, as well as provide the Duchess with their counsel in the leadership of The Conclave.